I will admit that the polygamous aspect of this book is what first drew me toward it. I have sort of a voyeuristic/train wreck fascination with it. This book, however, is not your run of the mill polygamy novel. For one thing, the polygamist in this book are not FLDS--although the man at the center of it was raised at Cross Creek. Instead, it is more of an end-of-days cult. In the center is one man, his 50 wives, and his children. 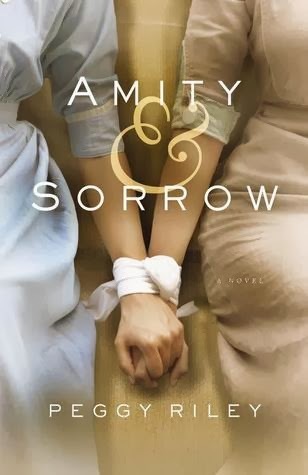 In the midst of gunshots and a fire, the first wife, Amaranth, flees with her 2 daughters. Amity, the younger of her two daughters, is a typical twelve-ish aged girl. Her older sister, Sorrow, is a different story. She is "the oracle" and uses that power to her advantage without a thought of consequences. There were many themes in this book, but the one I picked up on the most was the bond between these two sisters. The plot of this story was fascinating, but I felt that the execution did not live up to expectations. I'm not sure if it was Riley's intent to have the reader feeling that they didn't have a foundation when reading this book, but it wasn't a feeling that enhanced the experience of this book. Part of this may be because it just felt "thin" in places--there needed to be more detail and background in several parts of this book I didn't feel that enough of either to really sink my teeth into this story. While this was an interesting book and it showed great potential, it just didn't live up to my expectations. I was not solicited for this review and received no compensation for this post.